I got a nice set of wood chisels from my mother-in-law for Christmas. I mean these are really nice. I was kind of having a hard time using them because I really didn't want to hit them very hard with my hammer and mess them up. I have a rubber mallet, but it's kind of heavy. So I needed a wooden mallet...I was inspired by some of the posts I saw here but ultimately made one of my own design. Step 1: Find Suitable Hardwood. My kids thought I was crazy when I whipped the family truckster around and picked up a oak log out of a pile of yard waste in front of someone's house in our hood. I could see them craning their heads around trying to see what I was picking up. "A log dad?" "Really?" "Patience children, you'll see". So, got some hard wood. I cut it on my circular saw. That was not easy. I certainly hope I did not damage the blade because it had a hard time cutting through it. So I'm guessing I did well and scored some pretty solid material. Step 2: Cutting the Mallet Head. Once I got a good chunk of the oak cut from the log, I squared it off. I don't have the dimensions because I really just eyeballed it. Once the block looked like a good size, I went to work on the handle. I had a perfect handle sized piece of maple in my scrap bin. I rounded it off as best I could with my band saw and then hit the lathe. I was worried about sizing the wood down to fit the head. I figured the thing would fly off the lathe once I got it down to a workable size. It actually held up great. I did have to put it on the bench-top belt sander a bit to finish sizing it up. Once I got it to a size that would fit the hole I made in the oak mallet head. All I had to do was (carefully and precisely) hammer it down using a small dead-blow hammer. I made sure the handle stuck out of the head a bit. I wanted to do something cool like put a piece of oak wedge through the protruding part of the handle. I have seen similar things done on mallet projects here before. I ultimately ended up using a small a small piece of brass rod. I love using mix materials on my projects. I think the brass pin classes it up a bit too. I should mention, the mallet head was rounded up before I put the handle in. I just forgot to take pics of that process. I did it on my bench top sander or sanders that is...finished it by hand. I didn't want to overdo the detail of it because ultimately I'm going to be smacking things with this it's probably not gonna look this good forever. I finished the word with George's clubhouse wax. I use this stuff on quite a few projects and It works great. It's fast to apply, dry and if you ever feel like you need more you can just rub some on whenever. It dries well too. No waxing feeling or anything. It's great for bringing out the best in your wood grain. Looks great, and I hope the green head doesn't split as it dries out. But, if it does, there's always epoxy and sawdust and dowels to fill in and reinforce the crack. besides that method, there's always the bowtie inlay joint from a contrasting dark-colored species of wood. Bet you could use your chisels to accomplish this in old-school style if you don't have the router guide templates for the bowtie. Cool project. I love that it is from found wood. Yes, the handle was dry the head green. I did plan it that way. You're right in the position of the wood grain but I liked the look better this way. Plus I'm only going to use if for my wood chisels so it should hold up for quite some time. Thanks. Nice job, that handle grain color is beautiful! If the handle is dried wood and the head is "green", which sounds like the situation you have, then that is a very good combo for this project. The head will shrink as it too dries out forming an even tighter grip on the handle over time. About the only thing I would do different is to have made the end grain as the striking surface, face grain may split out on impact, especially after drying. 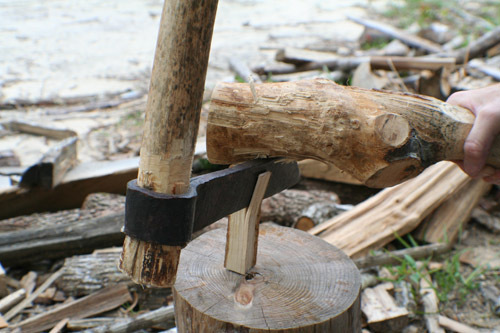 A froe is a handy tool to have for splitting out billets used for handles and other turnings from logs, but a hatchet or axe, driven by a maul, will do the same thing. Thanks for documenting this build. With a drill press and very carefully. I placed tape over the head while I did it too. I also used a small bit to start and worked up from there until the pin fit tightly. Thanks for looking. This is beautiful! How did you drill the hole so close to the mallet head?